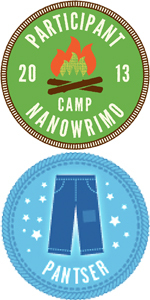 July is over and so is my month long stay at the virtual Camp NaNoWriMo. I spent the month working on a potential sequel to Hat Trick (and WOW, as of today, Hat Trick is just a month away from publishing!). I did not hit my goal of 50,000 words so I don’t get to go from “participant” to “winner.” But, I did generate some good stuff in the nearly 40,000 words I wrote during the month. Looking at the material I have, I think there is more than one book in what I’ve written. One of the major problems during the month was trying to tie the different plot points together into something cohesive. The material I have could become three (and possibly four as I had another idea late in the month) short stories or novellas. None of them would be as long as Hat Trick. What I’m envisioning could be a shorts/novellas that look at Simon and Alex in college. If it is four, it’s conceivable there could be one story for each of the four years of school. I’m going to let all this marinate in my brain for a while and see what makes sense. During Camp, Will gave me a submission call that he came across that seemed right up my alley: gay romance stories with the Winter Olympics as a background (of course, with the new Russian law in place, the Sochi games may not have the potential for much gay romance at all). It’s been a while since I’ve written for a call and I’m excited to give this one a try. My intention is to bring a hockey player and a curler together. The story is due at the end of October, so I’ll be getting busy on that immediately.